I’ve just seen that the Costume Institute of the Met has updated its highlights pages with some lovely new things like this coat by Fortuny, c.1930. I adore Fortuny. 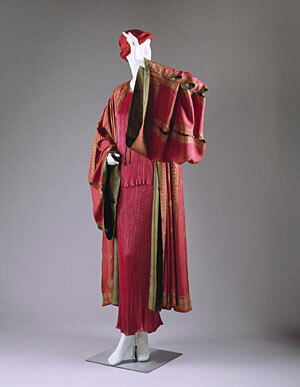 He designed clothes from about 1910 that were heavily inspired by Renaissance textiles – very dear to my heart. One of his techniques was to print pattern onto velvet with metallic pigments which mimic cloth of gold woven velvets, see here. He also created a technique of permanent pleating silk fabric to create fine gathers which clung to the body and were based on ancient Greek drapery. Very scandalous at the time, but by the 20s he was well established as one of the most innovative and desired designers of the time. You can see one of these dresses under the kaftan. This is pretty bright for Fortuny, he favoured natural dyes over chemical ones, so his clothes tend to be softer colours, but you can certainly achieve a red like this with several natural dyes. There are lots of other things on this site too, including a few 18th century dresses. Which reminds me…I’ve been asked to explain what a Mantua is. I like to maintain an air of mystery, but I suppose that it is a bit obscure. It’s a term used for loose gowns in the early 18th century and was used throughout the century to describe a number of types of gown. It’s a dress, basically, a very fabulous dress. Dress-makers were called Mantua Makers well into the 19th century. Here is one you can see in a 360 rotation photo.